Confined in small cages, bombarded by severe dental issues, blamed for several deaths, punished for poor quality performances... these are eminent facts that lead us to the conclusion: killer whales are unfairly treated. The orca documentary Blackfish left viewers ashamed and enlightened. Various issues hover over orca captivity, particularly SeaWorld's famous Tilikum. The killer whale Tilikum has displayed unfortunate behavior and health issues, yet he still resides in his tank at SeaWorld. Using orcas for entertainment is not only inhumane and inept, but also Tilikum and other orcas have been overworked and stripped of their natural abilities. Captive orcas cannot return to their true habitats; therefore, they should retire in "sea pens," comfortable and natural environments. Captive orcas' tanks are minuscule compared to the ocean. There is a dramatic difference between the lives of captive and wild orcas. Orcas live in pods and hunt fish, squid, seabirds, seals, and sealions. Orcas, dolphins, whales, and porpoises are part of the cetacea group, highly adept aquatic animals. Killer whales hunt using "novel hunting strategies that are handed down through multiple generations" ("The Killer Whale's Weapon: It's Brain" par. 3). Flexible, advanced cognitive abilities allow them to develop strategic protecting and hunting tactics. Killer whales in the eastern North Pacific "are structured into several social tiers, which possess distinctive cultural attributes in vocal, social, feeding, and play behavior" (Marino et al par. 23). Researchers have observed methods of profound communication in orca pods. In small tanks of confinement, captive orcas have little social interaction and prey. 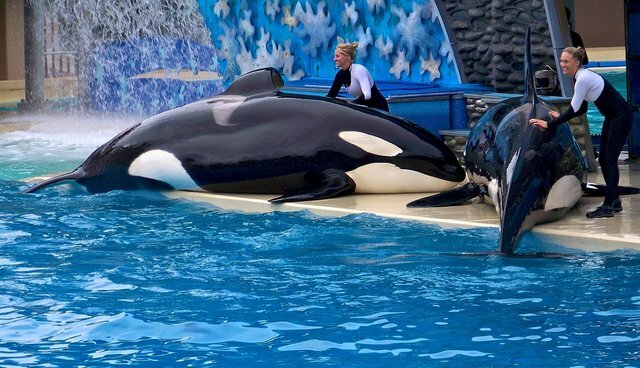 Trainers and caretakers feed orcas a constant diet of dead fish. These orcas are completely misplaced where they rely entirely on humans for survival. Unfortunately, long term, captive orcas would have trouble surviving if they are immediately relocated to the ocean. "Pedagogy," direct teaching, normally occurs between a parent orca and its offspring" (Mariano et. al par. 26). Tilikum, like several other captive orcas, was captured at two years young. He was unable to fully develop mandatory survival techniques in two years. Captive orcas cannot immediately survive in the wild and must be relocated to "sea-pens," where their development of necessary abilities can be monitored. Sea pens are small (much larger than aquatic tanks) netted areas of the ocean. The size allows caretakers to closely monitor orcas, and if needed, aid the animals (Garrett 26). If orcas can acquire essential qualities, they can be released to the open sea. This process is lengthy, but it provides a humane way to free the orcas from captivity. Water park enthusiasts and researchers argue that the orca entertainment industry allows children and people to observe orca firsthand. However, since the time orcas were first captured, research methods have improved. Now, orcas can be closely observed in their natural habitat. As a result of captivity, captive orcas suffer from higher mortality rates and severe health problems. Sea pens are hardly enough compensation for decades of orca mistreatment, but they are progressive steps forward. Works Cited Garrett, Howard. "Home at Last." orcanetwork.org. Orca Network, 2015. Web. 24 September 2015. Lori Marino, et al. "Cetaceans Have Complex Brains for Complex Cognition." plos.org. Plos Biology, 15 May 2007. Web. 24 September 2015.